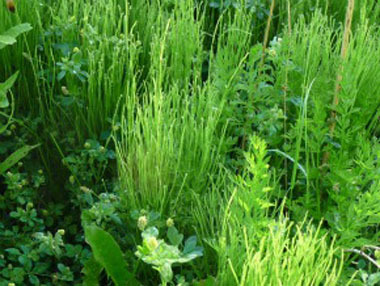 Horsetail has been used for centuries. Galen (Roman physician and philosopher approx. 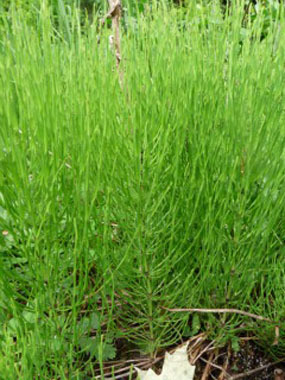 AD 129-199), used horsetail to aid arthritis, kidney and bladder problems as well as other ailments. This multi-purpose plant has numerous healing properties that include being an anti-hemorrhagic, antiseptic, antibiotic, an astringent, cardiac as well as a diuretic. Makes an excellent healing tea and cooked horsetail can be added to soups, stews or cooked in a stir-fry. Distinguishing Features: In early spring it has a brown stem with spore-containing cones on the top. Once the cones have released their spores this weed gives way to a different appearance by turning green. 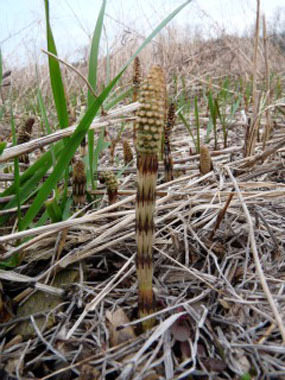 Horsetails have jointed stems with a ring of long, slender, tube-like pointed leaves with branchlets at each joint. Fields of Nutrition has medicinal benefits and vitamin/mineral content of Horsetail. Leaves: Long, slender, tube-like pointed leaves with branchlets at each joint. Height: 20 centimetres to 1 metre. Habitat: Waste areas, open fields, ditches, roadsides, areas along railroads (including the gravel ballast), alluvial forests, marshes, thickets, tundra, degraded areas as well as higher quality areas where soil if sandy or gravelly. Prefers moist soil. Edible parts: Aerial (cooked or dried).